Her on-screen sister Yara Shahidi may be “Grown-ish,” but “Black-ish” star Marsai Martin is making some big girl moves of her own. Per a January The Tale 24 article from The Hollywood Reporter, the 13-year-old is set to star in her first studio-backed feature film. But that’s not all. Martin actually conceived and pitched the project, called “Little,” to Universal Pictures. The film will explore what happens when a woman who is fed up with the drama of adulthood gets her wish to relive her youth. The first draft of the script was written by Tracy Oliver (“Girls Trip”) and the most recent is from Tina Gordon Chism (“Drumline”), who will also direct. 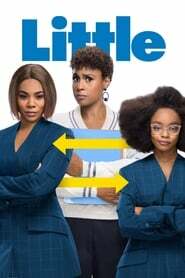 Girls Trip The project will be produced by “Black-ish” creator Kenya Barris, “Girls Trip” co-producers Will Packer and James Lopez, Josh Martin (Marsai’s father) and Regina Hall (also of “Girls Trip”). No word yet on a release date.